Some time in October every year I quit being able to get enough sun to make my own vitamin D. Eventually it gets too chilly to go out with enough skin exposed, and even if it stays warm late into the fall, eventually the implacable reality of the earth’s axial tilt means there simply aren’t enough minutes of the day when the appropriate frequencies of UV light shine down where I live. 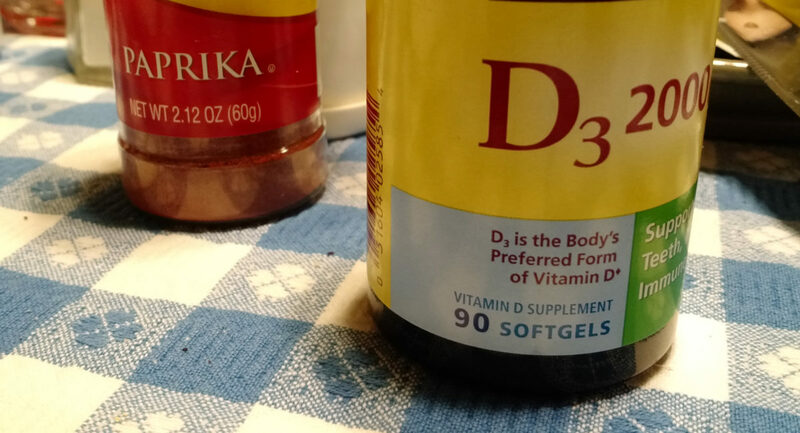 My experience has been this all works out to mean that I need to rely on supplements for my vitamin D needs for right around 180 days per year. With that in mind, I’ve taken to buying two 90-pill bottles of vitamin D each fall. When I notice—as I say, usually sometime in October—that it has been several days since I managed to get enough sun, I start taking the pills. Just a few days ago, I finished my first bottle and opened my second. That means I’ve made it halfway through! Another 85 or 87 days and I’ll be done with the pills and able to make my own vitamin D! It’s still a somewhat higher dose, which I think may be helping. So far this year I’ve only had a couple of days when I found myself glum for no good reason, a bit better than average, I think. Steven always warns me against imagining that spring starts before April. But soon—less than 90 days now—I’ll once again be able to make my own vitamin D.